Set into an incredible ivory ceramic pot, complete with a matching drip tray, this bonsai is positively gorgeous. The glossy green leaves of the Oriental Tea Tree bonsai are wonderfully set off by the small, delicate white flowers that appear in the summer. 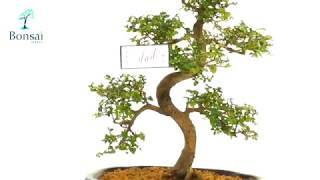 The S-shaped trunk and well-proportioned branches give this bonsai tree a delightful natural feeling. With a beautiful 'Happy Father's Day' plaque label, this indoor flowering bonsai would make the perfect Father's day gift. You can also add a free message to make your gift more personal, and choose from our gorgeous array of gift wrap. Comes with free care instructions and free delivery to most of the UK. An Elegant Flowering Father's Day favourite.